This will drive Paris Hilton and many more selfish people nuts: The interview really is not about you, if you want to get the job. 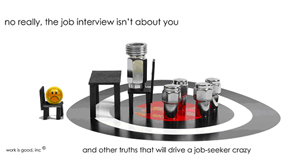 No Really, The Interview Isn’t About YOU! What a surprise to many, many people. You have been told and trained to REALLY focus on SELLING YOURSELF and understanding what you can do for the people with whom you are interviewing. Tie that tie properly, shine your shoes, get your elevator speech together, memorize your resume. Get ready to make close friends. Get a relationship going! Get nervous. It’s all about hitting THEIR goals, not yours. The interview isn’t about you. It’s about their goals, their department, their future and the company’s goals. They really could care less about you, if you can’t hit their goals for them. Period. Don’t let anyone tell you otherwise, especially someone who has not thought it all through. You see…if you spend the majority of the time talking about you, what will you know about them? Squat. What will they know about how you can help? Not a lot. In a two-way conversation, who is the most important person? The other guy. Not you. Know how to network? Know how to create a relationship. Be interested in the other person. Ask WHY, What, In What Ways Can I help You? Trust me. I’m a Doctor. Doctor of employment. In addition to showing that you are focused on their needs, asking questions about their goals also helps you to learn if the employer will be a good fit for you. We’re often so focused on trying to get the offer that we forget that the interview is a two-way street. While it’s important for the company to know that you are the person who can help them meet their goals, it’s also important for you to know that this company will provide an environment in which you can thrive, a place where you can put your experience to effective use and continue to grow in your field of expertise. In many ways the interview is like match-making. If its a good match for both you and the employer, you’ll be more enthusiastic about the work you’ll be doing and that will enhance the quality of your work. When that happens everyone wins. You have a job you enjoy and the employer gets results. Heidi: Excellent points. The old idea of being a “slave” to a job (boss dictates, you do) has been supplanted by the idea of COLLABORATION. The VALUE of collaboration is simply a “two-way” street. BUT…even in The Great Workplace 2.0, collaboration is MEETING GOALS. That also is a two-way street. GOALS, PURPOSES.